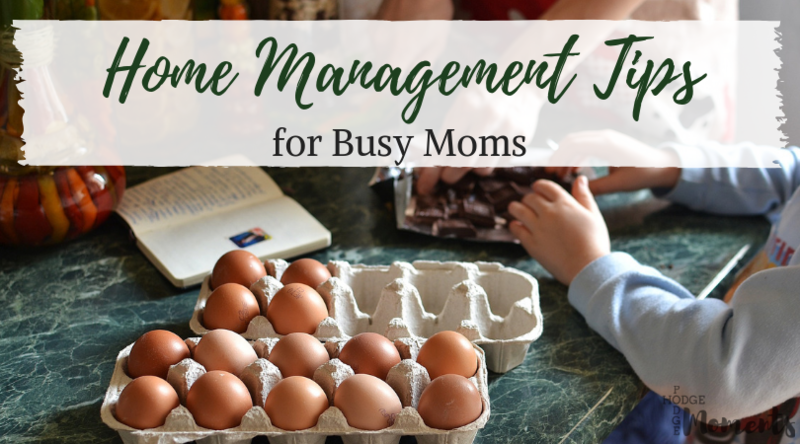 When you’re a busy mom, keeping up with the house can seem like an overwhelming task. However, not keeping up with it can seem even more overwhelming. There are a few simple things you can do to help alleviate this overwhelm and today, I’ve invited a guest to share her tips with you! Let’s welcome Britney of healthymombod.com to the blog today! I know I’m not alone when I say managing a household can be overwhelming. Most days I wake up and feel determined to tackle all of my cleaning, meal prepping, and organization within the same day. Other days I don’t want to do anything. I end up over working myself and by the next day my toddler has already trashed the house. It can feel so discouraging to work yourself so hard only for the house to be a mess again quickly or for your projects to not be completed right away. It’s fine to do things little by little each day. Find a routine that works best for you. 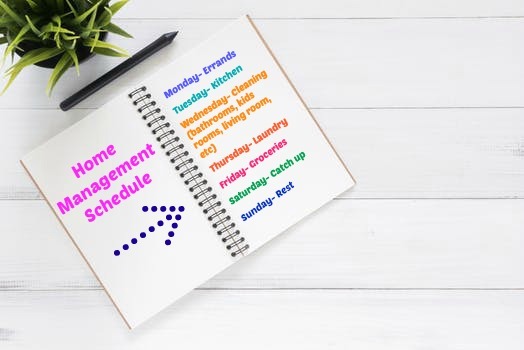 Here are a few of my own tips through trial and error that will help completely change the way you manage your household. Monday morning I woke up determined to tackle each room in the house, grocery shop, and meal prep. I ended up feeling really disappointed in myself because while managing a raging toddler that day, I didn’t get much completed. Life happens and things do get in the way. I wondered if creating an undemanding schedule was even possible. I toyed with the idea of breaking up my tasks throughout the week would even help. At first glance I felt like I might be even more overwhelmed. I prefer to complete projects and tasks straight away so that I have more time for other activities. I decided to give it a try. Creating a schedule was the best thing I ever could have done for my household. Although its not perfect, my week runs a lot smoother and I am not so swamped. I started assigning small chores to my toddler. She was actually extremely excited for this! It makes her feel important and grown up. She picks up toys, folds little blankets, and even gets to sweep bathroom floors with her little broom set. I hope her enthusiasm with chores carries into her teenage years! Are you ready? Here is the gist of my weekly schedule. I’m off work on Mondays so this is the one day I’ll run all my errands and I’ll schedule any appointments for this day. Tuesdays I devote a little time before work and some time after work to cleaning the kitchen. This includes dishes, wiping down counter tops, and cleaning out the fridge. It seems like a lot but once you have a system in place it gets easier each week! I ask my family to rinse off their plate after meals. This helps make loading the dishwasher quick especially on my catch up days. On Wednesday I spend time wiping down and disinfecting the bathrooms, tidying up bedrooms and organizing the living room. Thursdays are laundry days. On Friday I plan out meals, create a list and then grocery shop in the late evening. It’s so peaceful and you miss the crowd. Saturdays are catch up days which means I do left over tasks I didn’t have enough time for during the week. I’ll do extra loads of laundry or give my kitchen more TLC. Sundays are typically for rest but as a mom that isn’t always the case. Make sure you do designate a day or even a couple of hours for yourself to rest! Adjust your schedule as often as you need to. If you know you won’t have enough time in the day to get something done, don’t sweat it! I realized that in reality we will never be done managing our homes. It’s on going so don’t beat yourself up for not finishing tasks and if you’re having a rough day and need some “me” time, take it! If only there were apps to help keep our lives in order. Oh wait, there is! I recently discovered Timeline Task To Do List and after checking its rating and reviews, I downloaded it immediately! Other than writing out a schedule for the week you can use this amazing app to organize to-do’s such as chores and paying bills. The app allows you to schedule specific tasks for certain days. The utility bill is due on the 12th and so I set a reminder for myself to pay it a few days earlier (personal preference). It’s even great to set reminders to return a Red Box dvd or if you’re on a free trial for a product and want to cancel before it auto bills. Timeline Task To Do List is a lifesaver. Plan to Eat completely takes care of everything when it comes to planning meals! This amazing app stores your favorite recipes and gives you the option to import recipes from places like Pinterest! To plan a meal all you have to do is drag and drop recipes from your imported list and it automatically creates a grocery list for you. This is a huge win for me because I’m the mom who shows up to the grocery store realizing she left her list at home. Or if I do have my list there are always items I forgot to write down. I also really love that the app gives you step by step instructions for cooking your favorite meals. No more needing to google search or launch other apps to look up directions for a recipe! Overall this app is extremely easy to use and for $40 a year ($3.33 per month) a great investment for busy moms. Lastly HomeBudget is the most user friendly app for budgeting your money. It’s extremely organized and puts your expenses into categories (recurring billings, one time purchases, income, etc). This way you have a clear overview of your monthly expenses and how much income you have coming in. This app also has a feature for scheduling reminders to pay bills and you can upload copies of receipts for future reference. I hope these tips are helpful to you all in managing your homes in the least stressful way possible! Britney blogs at Healthymomhood.com. 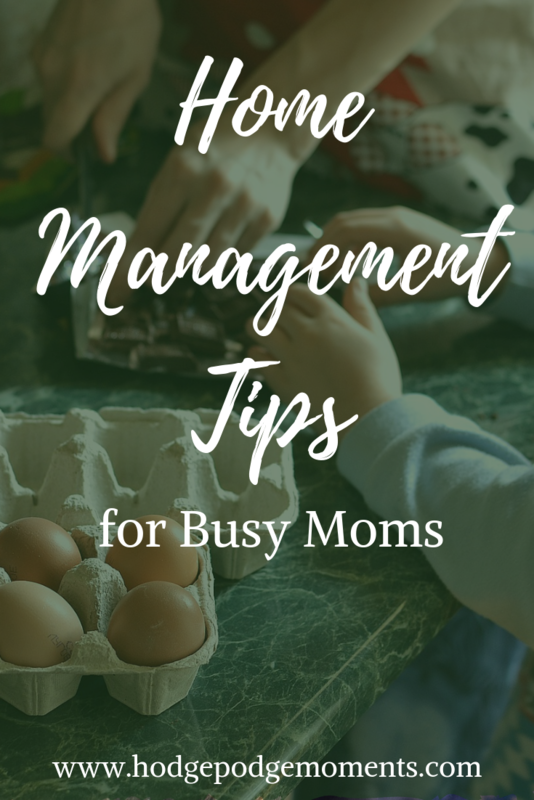 She enjoys fnding ways to help busy moms save time and money. She works full time in finance and use blogging as a creative outlet. She’s a fellow military wife and mommy to an adorable 3 year old girl. She’s excited to share her tips with you all about managing your homes as well as her favorite organizational apps that keep her sane.